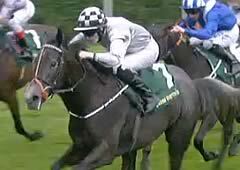 Agnes Stewart relished the step up to a mile, winning the May Hill Stakes for Eddie Lynam and jockey Billy Lee. The astute Eddie Lynam went for two birds in the bush with Agnes Stewart, rather than one in the hand, and saw the gamble rewarded. "We had a huge offer for her last week," he explained, "and I got a bit nervous. But her owner Steve [Parkin] said no, we know she's good, and so we decided to keep her. We did think that she was very good but it scares you a bit when you have to go and prove it." The daughter of Lawman, the 11/4 second favourite, took the mile contest, a reliable pointer to three-year-old talent over the years, by a length and a quarter from the 13/8 market leader Muraaqaba. "She'll be a lovely middle-distance filly for next year," said Co Meath-based Lynam. She was ridden by Billy Lee, who said: "She travelled well the whole way. I was just getting there a bit earlier than I liked and I was trying to hold on to her. I knew that she would stay and I went for her and she kept galloping all the way to the line. She will hopefully improve away over the winter and come forward. She will get a bit further bit I think she still has plenty of pace for a mile next year." Agnes Stewart is likely to return to Britain for the Fillies' Mile at Newmarket next month, for which she will have to be supplemented. "She should have been entered already but the trainer got it wrong," admitted Lynam. "I wrote the name Anthem Alexander [his other high-class juvenile filly] on the entry form instead of Agnes Stewart. "She'll have one more run this year. The Prix Marcel Boussac is the altenative, but I should think it will be Newmarket." Agnes Stewart runs in the name of Parkin's firm Clipper Logistics, which sponsored the Leger Legends Stakes on the opening day of the Ladbrokes St Leger Festival. Agnes Stewart was bred in partnership by Joe Foley of Ballyhane Stud and John O'Connor of Ballylinch, home of Lawman, and bought by Lynam for €23,000 as a yearling. Her lineage was already well-known to Parkin, who bought her dam Anice Stellato (trained by Ralph Beckett to win twice) as a yearling for €70,000 and sold her on as a potential broodmare to Foley for 15,000gns as a four-year-old. Now his continued interest in the family has reaped its reward. "I think you could say she was well bought as a yearling," added Lynam, best known for speedy types like the top sprinters Sole Power and Slade Power and the speedy Anthem Alexander. 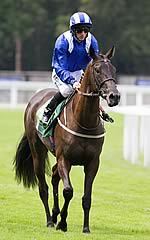 "She is not my normal, she is a middle-distance, 10-furlong filly. But she has got a great cruising speed. She just lobs along and is very easy to ride, not free or silly. And Bill gets on well with her." Deirdre Johnston, wife of trainer Mark Johnston, was in a reflective mood after the 13/8 favourite Muraaqaba could only finish the length-and-a-quarter runner-up behind the impressive winner. The daughter of Dubawi couldn't quite match the finishing kick of the winner in the final furlong but Johnston was very much looking forward to the future following the race. "She's still finished second in a Group Two - one of the best races for fillies this season - and we're happy with her," she said. "Although she's in the Fillies' Mile at Ascot later on this year, we'll have to think about that now. I think she'll make an even nicer horse next season." Richard Hannon, who saddled the third-placed Shagah, was also happy with his filly's performance. "We've been placed in a Group Two so that's the black type in the bag," he said. "There will be plenty of more days for her."